Are you ready for some foooooootball?! Football fans and food fans unite next weekend for the big celebration. If you are like me the only reason the Super Bowl is even slightly appealing is because of all the delicious food that will be present. That and the commercials. It also sounds like Red Hot Chili Peppers will be performing during the halftime show which should make tuning in worth while. I think the best Super Bowl party food leans more towards the snacks/appetizers category. Food that your guests can grab during a commercial break or one of the umpteen timeouts called. 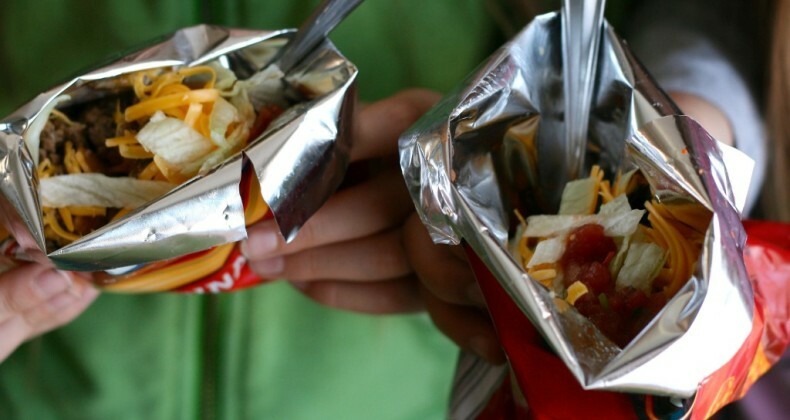 These walking tacos will be a major hit with all your party guests. My favorite Mexican ground beef can be cooked ahead of time and kept warm in the Â slow cooker on game day. 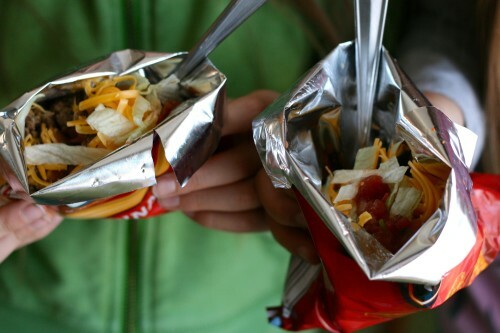 Guests then can top their walking tacos with their favorite taco toppings.Â For our walking tacos I bought a variety pack of chips that included Fritos and Nacho Cheese Doritos. Prepare ground beef according to recipe. Keep warm in a slow cooker on the lowest setting or warm setting. Give the chips a slight crush before opening the bags. Top with ground beef, beans, cheese, lettuce, tomatoes, onions, black olives, salsa, sour cream, guacamole, and/or cilantro.